Did you know that RR-NET-compatible devices, such as 64NIC+ can be used in VICE? Doing so has many advantages because you can run RR-NET enabled programs from your emulator, provided that you are on a network. 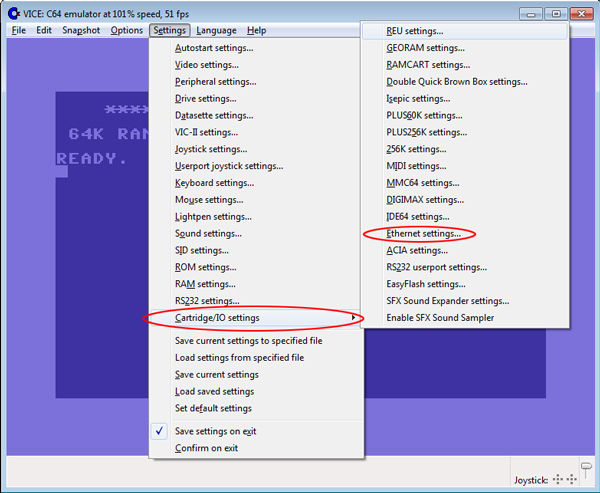 This article will show you how to configure VICE to use RR-NET emulation. VICE supports many add-ons, cartridges, and other hardware. You can tell VICE to use RR-NET emulation for Internet access, but you have to jump through a few hoops first. This article will focus on Windows installation only, but other platforms may be similar. Earlier versions of VICE had some problems with networking under certain conditions. Once you download VICE (or download older versions of vice - note: v2.2 or greater is needed), you should have no problems getting Internet access using RR-NET. VICE requires a promiscuous mode network driver, which is not normally available in Windows so you need to download a driver, as suggested on VICE's knowledge base. After you install this, Windows might make you restart your computer. If not, be sure to completely exit VICE and start it up again so that it can recognize the new driver. Set Ethernet Adapter to RR-NET and select your Ethernet Adapter. Please note that WinPcap does not support some wifi adapters - it seems to like only wired LAN connections. If you do not see your Internet Adapter listed, VICE may not be recognizing the driver properly, in which case you might need to restart your computer or bind your device to the Internet in the Control Panel. After you set these up, be sure to close ALL instances of VICE and restart. Upon restarting, your RR-NET device will be "plugged-in" and ready to use. You can then LOAD and RUN your favorite RR-NET-compatible software.